This 2 Year Safeware Extended Service Plan covers All Parts & Labor for 2 years, Accidental Damage (including drops, spills, cracked screens) for normal wear & tear, and power surges that result in damage to your device. The warranty also covers a No Lemon Guarantee - If the device fails 3 times (for the same issue) during the warranty term, it will be replaced with a like, kind and quality unit. This warranty is valid for 2 Years on items up to $999.99. *LIMIT OF LIABLITY: The limit of liability under the replacement plan is the value of the Covered Product at the time of purchase, excluding sales tax and delivery and handling. This Agreement shall expire upon replacement of Your Covered Product in issuance of (compensation) in lieu of replacement. 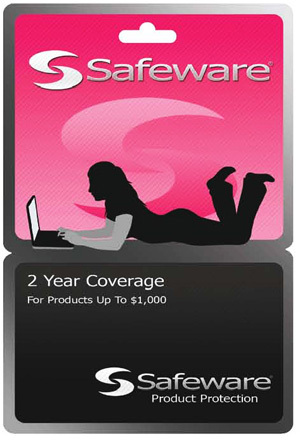 ALL SAFEWARE EXTENDED WARRANTY PLANS ARE FOR COMPUTER AND TECHNOLOGY ITEMS PURCHASED THROUGH THE PHILADELPHIA UNIVERSITY BOOKSTORE. THE SERVICE PLAN MUST BE ON THE SAME RECEIPT AS THE COMPUTER OR TECHNOLOGY ITEM.